Growing meat rabbits is basically easy. Put boy rabbits and girl rabbits in together with food and eat the excess bunnies. Simple right?? Unfortunately it can be a little more complicated than that if you want to be efficient and aim for optimum growth in meat rabbits. Here are four tips and tricks that will ensure that you are getting the most meat for the smallest amount of feed/effort. Choosing the right meat rabbit breed for your situation is a good place to start to ensure you are getting optimum growth in meat rabbits. Choose a breed known for growing big, fast. 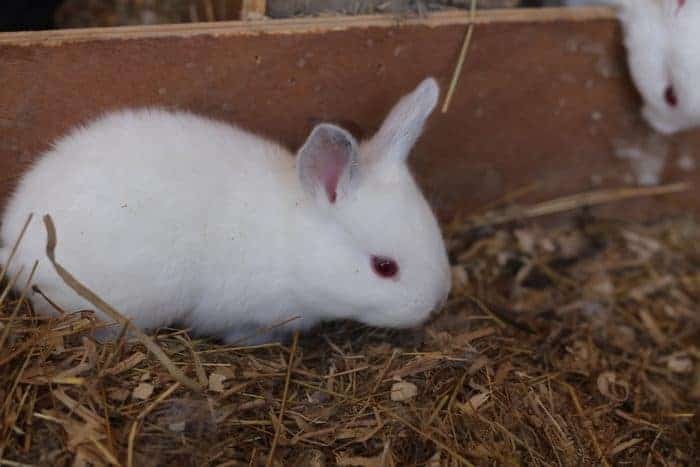 See my article about choosing a breed of meat rabbits for more tips on this. A proven meat line from someone that actually breeds rabbits for meat is going to be much more useful to you than a show rabbit with a pedigree. 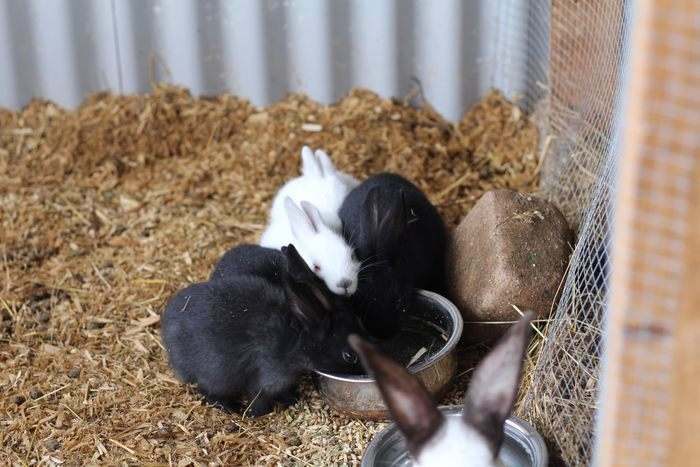 If you are planning on raising meat rabbits in a colony like we do (and we recommend that you do), I suggest you try and find a colony breeder or at least get very young stock. Living in a colony is a big change to cage life, young ones adapt faster to the change if all you can find is caged rabbits. It is worth being patient about this. Overall Health – Clear eyes, sleek clean coat, clean ears, even teeth with the top ones in front of the bottom. A good conformation – Meat rabbits should be the shape of a ball. Their hips should be about as wide as their shoulders, and when viewed from the side, they should be nice and rounded. The 104 homestead have some great photos showing the difference. Age – You should not buy rabbits under 8 weeks of age, they should stay with their mother until then. This ensures they get the best start to life. 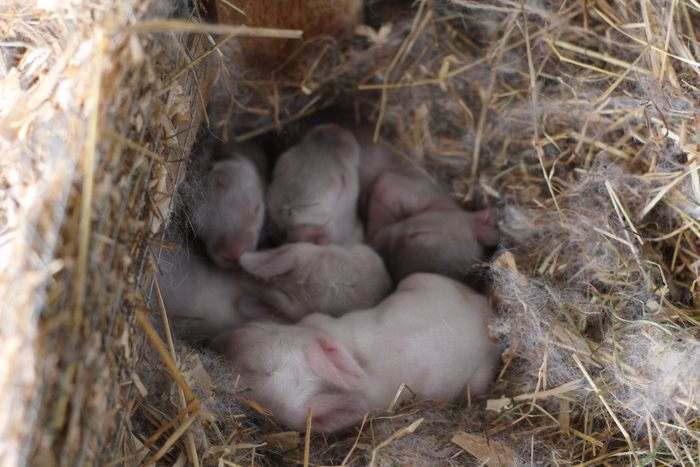 Rabbits should be bred between 18-26 weeks of age to avoid loss of their first litters. If your rabbit is older than this, ask about their breeding history – number of litters, number of kits, number of survivors to weaning age. I would avoid any rabbits that are over a year old that have not yet had litters, they are often too fat to breed by that stage. If they do manage to breed, many does will find it too stressful to adjust to and really struggle with motherhood. Temperament – Ideally your rabbits will have had contact with humans right from the start. Avoid any that are aggressive or absolutely terrified, as they will be difficult to have in a colony setting. Weight – At 8 weeks a good line of rabbits will be about 3lb (1.5kg), an amazing line will be closer to 5lb (2.5kg). By 9 months your rabbit should have pretty much reached its ideal adult weight for its breed. For most meat breeds this is 8-11lb (4-5.5kg). Rabbits need to be kept dry and out of the wind. Other than that, how you house them is really up to you. We prefer a colony set up. Colony rabbits grow more lean, with more muscle mass than their caged counterparts due to all the running around that they do..
One option for housing rabbits is in the dirt. There is a lot of benefit to allowing your rabbits to live in and on the dirt. One of the most significant benefits to dirt is that it is an amazing insulator. Cold bunnies don’t grow well. Trying to keep themselves warm uses a lot more calories, and the rabbits will be eating a lot more food and growing much slower when they are cold. For optimum growth in meat rabbits you need them to be able to stay warm. 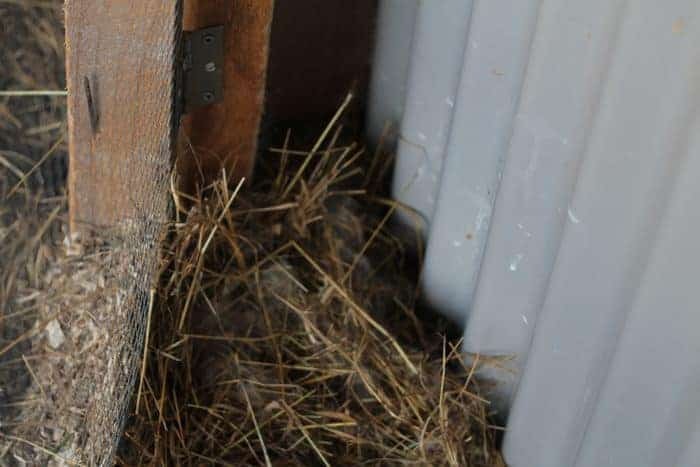 You don’t need to heat their housing, but they do need to be able to make a warm nest somewhere sheltered and dry. Here is some photos to show you what impact the cold can have. These litters were the same size and weight when born, and are from sisters and born within 24 hours of each other. 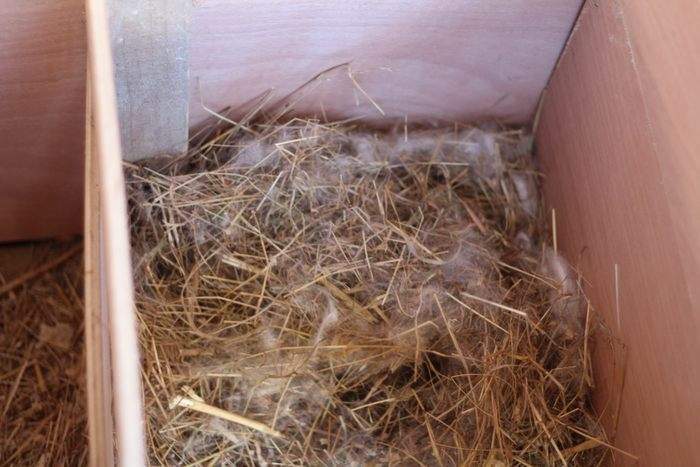 This litter is born in a dry warm nesting box with a good layer of hay under their nest. This litter is over in the middle of nowhere, beside the cold tin siding and straight on top of the cold, damp bricks on the floor. 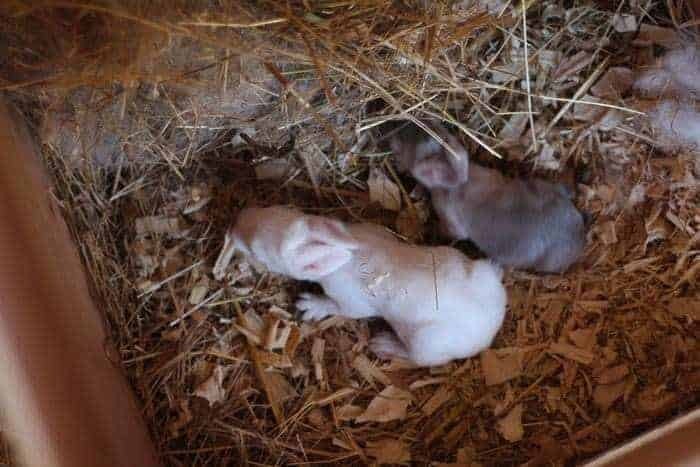 As they are Californians, the color on their nose/ears/tail/feet is temperature controlled – the little grey baby is in fact a white bunny that got chilled all over and triggered the color genes. You can clearly see the size difference between these two babies, one from each litter. The colder litter are all much smaller than the warmer litter. For optimum growth in meat rabbits they need a high quality, high protein feed. Ideally you would have close to 18% protein. This is difficult, but not impossible to achieve without using pellets. Naturally fed rabbits need a half cup of safe greens per pound (500g) live weight per day. 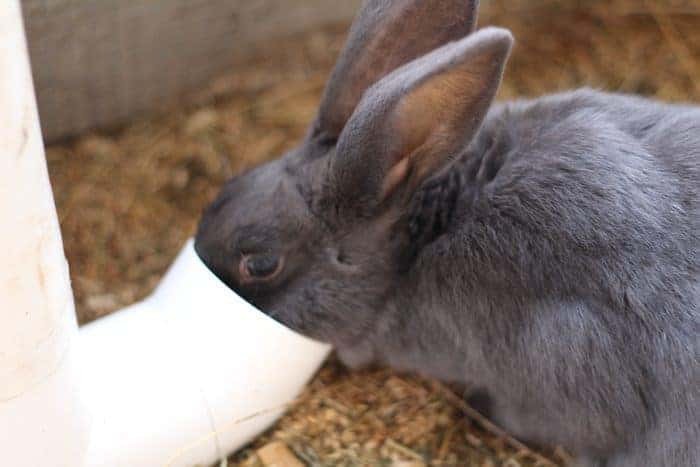 See our post on feeding rabbits for a list of safe foods. They will also need free access to a quality grass hay, some alfalfa (lucerne) hay and some grains – barley, oats and wheat are all good options. You can raise rabbits very well on barley fodder. With free-choice hay always available to them. Keep an eye out for patterns. You want to know what buck/doe combinations do the best. Who your best mothers are and keep looking for kits that are of good shape and grow quickly. Cull any stock that fail to thrive, fail to produce litters or fail to raise young to weaning. 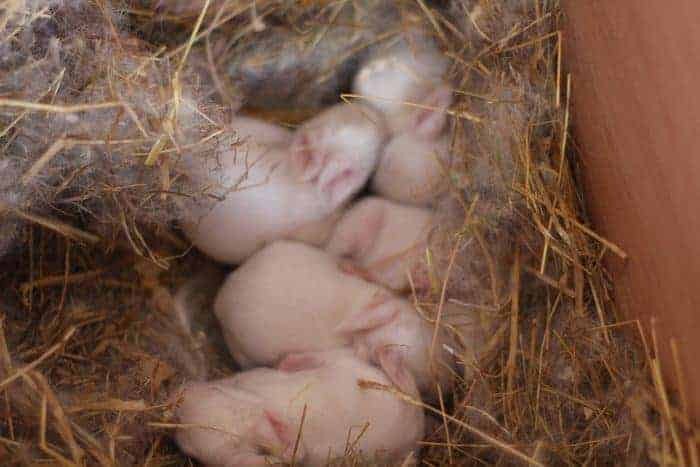 Most breeders give their rabbits 3 chances to get a surviving litter. To cull means to either eat/kill them or just to remove them from the breeding program. Keep your best kits to replace your adult stock regularly. Most rabbits will produce well until they are about 4 years old. Some continue for several years more after that. You can selectively breed resistance to most conditions in your rabbitry. To do this you must be prepared for losses. Sometimes catastrophic losses. Only breed rabbits that appear to be in good health, and be ruthless with your culling from the breeding program. Any breeder that produces sickly kits consistently needs to go. As does any doe that is clearly sickly herself. Does that have trouble with mastitis or gut problems also should be culled from the breeding program. Rabbits that are kept clean, dry and well fed seldom get struck by illness. But it does happen. It is up to you weather you choose to treat, or take the hard line approach and simply put them out of their misery. Our rabbit disease guide has symptoms for most illnesses that rabbits will get, and both herbal and conventional treatment options. So there you have it, four ways to improve your meat rabbits growth ensuring that your grow outs grow as quickly and as well as possible. 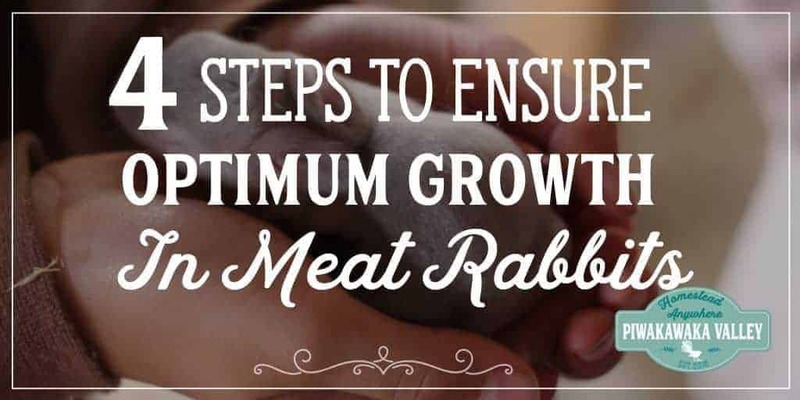 Do you do anything to ensure your meat rabbits grow well? Let me know in the comment below. This was very informative. I started raising meat rabbits in the spring, currently we’re using cages but I’m dying to start raising them in a collony. It just feels right. Thank you for this article any help is very much appreciated! Hi Crystal. Thank you , you are very kind. I hope you find all the information on colony raising helpful, we really like it as a humane way to raise our bunnies.